In 2004, my dad passed away at the age of 96. In his Last Will and Testament, he designated cremation for his body but did not specify what to do with the ashes. After the cremation and memorial service, I asked my mother what she thought we should do with them and she suggested perhaps spreading them somewhere in nature, since he liked nature walks. However, I was concerned that spreading them in nature was like littering. My chief concern was that the ashes may contain toxic chemicals and therefore it would be irresponsible to spread them in nature. Since no one else in the family was interested, I collected the nondescript black plastic box of his ashes and placed it on a shelf in my closet. Recently, I have decided to revisit my dad’s choice of cremation, the dispensation of his ashes, and my own feelings about my body after death. The presence of my dad’s ashes in my closet for these six years felt like unfinished business. The catalyst for this reexamination was a class last semester studying carbon footprints and life cycle. When I prepared my own will some years ago, I selected cremation for the same reasons Judy Collins wrote in Song For Duke that “funerals were a waste of flowers.” I felt that graveyards were a waste of land. Now, armed with information about greenhouse gasses and toxic chemicals, I chose to research the issues. The questions in consideration were the potential environmental impacts of various forms of body disposal and whether there are commercially available choices for sustainable burial. The search led to the Green Burial Council (GBC), an independent, nonprofit organization that provides guidance to the mortuary and cemetery industries regarding environmentally sustainable deathcare practices to reduce greenhouse gas emissions, toxification, and waste; and to preserve natural areas. Burial in caskets represents 70% of annual body disposal in the USA. This usually involves embalming the body with formaldehyde (a carcinogen) to slow decomposition and then interring in a metal or wood casket that is often encased in concrete and then buried in the ground in mostly commercial cemeteries. According to the GBC, “cemeteries across the nation bury approximately 30 million board feet of hardwood, 104,000 tons of steel, 2,700 tons of copper and bronze and 1.6 million tons of reinforced concrete” annually (Rudolf, 2010), hardly a sustainable practice. 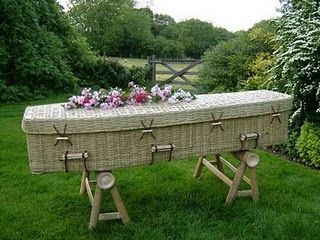 Responding to popular demand from a growing green movement, sustainable coffins made of bamboo, cardboard, and other biodegradable materials such as shrouds are now commercially available, as are nontoxic embalming fluids; and the GBC promotes their use along with creating standards for ecological burial grounds in keeping with their mission. Cremation is a process that reduces the body to its base elements. Traditional cremation is a process that involves sustained temperatures of 1,800ºF for two to three hours and thus typically releases 573 lbs. of carbon dioxide and emissions of mercury vapor from dental fillings into the atmosphere. A new process that uses just one-seventh of the energy is alkaline hydrolysis, known by its trade name, “Resomation.” This procedure takes the same amount of time as traditional cremation using lower temperatures (365ºF), high-pressure (145 psi), and chemicals (water and potassium hydroxide) to emulsify the body into a sludge that is then chemically treated to lower pH and then disposed of into municipal sanitary sewer systems and mercury emissions from dental fillings is virtually eliminated using this method. The remaining bone is then pulverized into a fine white powder. According to the manufacturer, resomation results in a reduction of greenhouse gasses of 35% over traditional cremation. My research showed that the remains by either method are reduced to ecologically safe dry calcium phosphates, which are used in making fertilizer. Cremation remains are usually either kept in urns (and then displayed or buried in cemeteries), or spread into the environment. • Hybrid burial grounds simply allow sustainable burial (no embalming requirement, biodegradable coffins accepted, and no requirement of a vault). Actress Lynn Redgrave was buried in this bamboo coffin (Harris, 2010). • Natural burial grounds requirements include the following: that the land must be pre-assessed by an independent professional ecologist to identify any issues regarding endangered species, cultural resources, and hydrology; that bodies are either not embalmed or are embalmed using only GBC-approved non toxic chemicals; that burial containers must be either made of nontoxic materials or be biodegradable; a ban on the use of pesticides; and that an endowment and rules are put in place to sustainably govern the site perpetually. • Conservation burial grounds are GBC’s highest rating. In addition to the burial practices outlined above, it requires siting “contiguous to, or in a position to augment the conservation goals of an ecologically significant park, wildlife corridor, critical habitat area, or permanently protected open space; or (with appropriate management practices) be large enough on its own to be considered a landscape-level conservation effort” and be managed as such. Excavation and burial practices must also be minimal in its impact on the land and plant diversity; and the site must operate in conjunction with an environmental stewardship organization such as a government agency or NGO legally bound to it to manage it as such in perpetuity. After researching, I see that cremation is not sustainable and I will rethink my own decision for deathcare—likely opting for an ecological burial without embalming, and interring in a GBC-certified conservation burial ground. 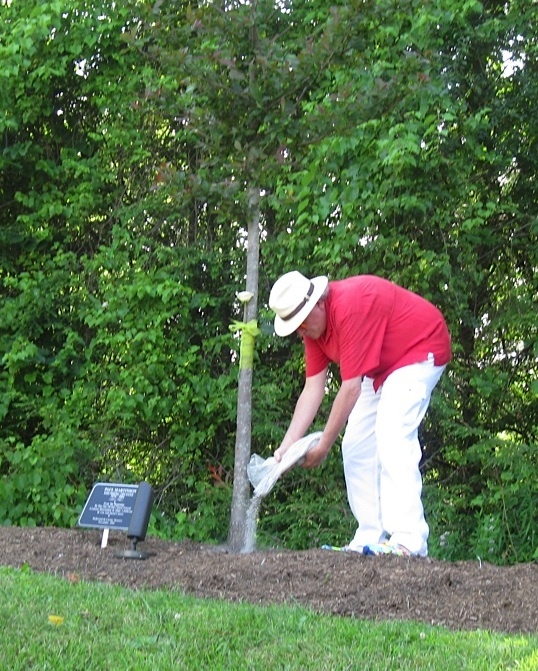 Regarding dad’s ashes, we spread them on July 12, 2011 on the roots of a tree planted some years ago in his honor at Shakespeare and Company in Lenox, Massachusetts, where he served as a Founding Trustee. In the end, at least some of his remains have returned sustainably to the nutrient cycle of the earth. Recently, one of my esteemed sustainability professors, Bruno Sarda, made me aware of an Italian company, Capsula Mundi, that has come up with a unique idea that ties together an ecological approach with the idea of a memorial tree—an egg-shaped pod made with 100% biodegradable material is constructed and the body is placed inside in a fetal position. The pod is then planted in the soil and a tree is planted atop. The goal is essentially a reforestation project where instead of cemeteries, one creates “memory forests” where loved ones could come and care for the tree as a tribute. Perhaps the GBC’s eco-certification program will consider a fourth classification for eco burial. important topic! i forwarded your blog post to my friend and former student Aaron, who runs an online eco-sustainability paper. http://paper.li/aaronnizzie/1307407511#. How is an individual who expires in one part of the country, transported sans embalming, to another for ecological burial ? That is a very good question Marina. Thank you. I will ask the Green Burial Council and post their answer here. Marina – according to the Green Burial Council, Jewish corpses are traditionally not embalmed and are shipped across country as a matter of practice. Very fascinating! I, too, had thought cremation was the best and most eco-friendly route, especially considering amount of land needed for burial. I hadn’t heard of GBC before. Are there any GBC-certified conservation burials in AZ? I could not find any certified in Arizona – perhaps a business opportunity is lurking. I did find one in the State of Washington (White Eagle); apparently the only certified wilderness cemetery in the USA. See http://www.naturalburialground.com/ . Unless there other options closer to home, someday this one will be mine. This may not exactly be for everyone, but you can also choose to have your remains donated to CSI-type researchers who learn about how bodies decompose naturally over a period of time, which in turn helps them know what to look for when searching for lost remains or placing found remains with how long they’ve been there. Again, not for everyone, but generally it’s a free donation, so very cost-effective, and definitely a necessary part of the crime-fighting area. Thank you Karyn, and one could also donate their body to medical science. Personally, I want my body to return to the nutrient cycle of the earth. UPDATE: I met with my attorney this week and added the language to my Last Will & Testament directing my heirs to order an ecological burial and internment in a GBC-certified conservation burial ground.